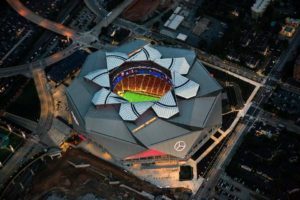 Mercedes-Benz Stadium in Atlanta is hosting Super Bowl LIII on Feb. 3. There is little doubt — after last week’s divisional playoff games — that the four best teams will compete for the chance to play in Super Bowl LIII on Sunday, Feb. 3 in Atlanta. The number one conference seed will play the number two seed. These are the four highest scoring offenses in the league. And both the Los Angeles Rams and New Orleans Saints, and the New England Patriots and Kansas City Chiefs, faced off in epic regular season games this season. Both teams are virtually even, with the home teams favored by three points, which odds makers typically give automatically to home teams before analyzing match-ups. And last weekend, all four home teams won, although the Saints had to overcome a 14-0 deficit and my perfect 4-0 forecast was tarnished when the Indianapolis Colts didn’t show up in Kansas City. These two games are so difficult to pick. All four teams have great things going for them. Chiefs quarterback Patrick Mahomes could be the league MVP in his first year as a starter. The Patriots play in their eighth consecutive AFC championship game, but have not won a road playoff game since 2006. The Rams annihilated the Dallas Cowboys run defense in a game not nearly as close as the score indicated. And the Saints eliminated the defending Super Bowl champion Philadelphia Eagles in front of a roaring home crowd who were full of oysters and Sazeracs. Let’s see how it might play out. In the NFC, the Rams play the Saints on Sunday, Jan. 20 at 2:05 p.m. The Saints started out flat on Jan. 13 before they stepped on the gas against the Eagles. But in the game, they lost defensive tackle Sheldon Rankins as he suffered a torn Achilles. They could feel the loss as they try to stop a Rams offense that had a dominating running game against the Cowboys. The Rams ran for a franchise playoff record of 273 yards rushing. C. J. Anderson, seemingly out of nowhere, rushed for 123 yards and two touchdowns. While the Cowboys focused on Todd Gurley, he ran for 115 yards and a touchdown. Their performances took the pressure off of young quarterback Jared Goff in a 30-22 win at the Los Angeles Coliseum. But the Saints still have the original two-headed monster in the playoffs in running backs Mark Ingram and Alvin Kamara. Wide receiver Michael Thomas is a bear, and the Rams were not able to contain him in the week nine Saints 45-35 victory that knocked Los Angeles from the unbeaten ranks. Rams head coach Sean McVay and Saints head coach Sean Payton are two of the most respected in the league. McVay put together a brilliant strategy to beat the Cowboys, whose run defense had been a key part of their success all year. But the Saints defense is improving as well. This will be the Rams first NFC championship game in 17 years. For Saints quarterback Drew Brees, he is reaching the end a Hall of Fame career. Take the Saints with a home field advantage, but expect the Rams to be a force to be reckoned with for years to come. In the AFC, the Patriots face the Chiefs on Sunday, Jan. 20 at 5:40 p.m. The Chiefs haven’t been to the AFC title game since 1993. The weather is supposed to be below zero, which could give an advantage to a cold weather team like the Patriots. The Patriots beat the Chiefs 43-40 in week six, and how can you bet against head coach Bill Belichick and quarterback Tom Brady? But Chiefs coach Andy Reid gets the most out of his players, and Chiefs wide receiver Kareem Hunt is a difference maker. It will get down to Mahomes and Brady. The kid versus the veteran. But it will be the speed of the Chiefs offense and special teams that will make the difference. I think it will be Kansas City in a game that won’t be as high scoring as their regular season tilt. Sunday, Jan. 20 shapes up to be a great day of professional football. One game is in a dome and the other is outdoors in the elements. It is fitting that the best four teams in the NFL will fight it out for the Vince Lombardi trophy.